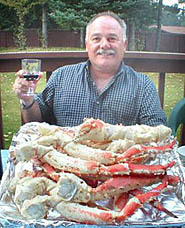 The perfect cooking instructions and recipe for great Alaska King Crab legs. You can thaw and eat these Crab Legs cold; perfect for a king Crab Salad or sandwich. Best Method: Take a large pot of water and add 1/2 cup sugar. Bring to a boil. Place frozen legs in pot, submerging all legs. Reduce heat to lowest setting. Cover pot, do NOT boil. Crab is ready to serve in 20 minutes. (TIP: break legs into smaller sections if pot is not large enough to hold full leg. OR If you do not have a large pot, place legs on baking sheet and add at least one inch of water. Cover tight with foil. Put in a pre-heated oven at 325 degrees for 30 minutes. Serve with warm melted butter, try adding garlic or other herbs. ENJOY!! !